The former NPR Chief “comes out of the closet” on gun rights. The anti-gunners are dealt a blow in Illinois when a bumpfire stock and trigger modification bill failed to pass the House. Even a few anti-gun Democrats wouldn't vote for it. Meanwhile Mayor Bloomberg's Everytown is pouring millions into Virginia State elections. His efforts will likely fail as they have elsewhere. 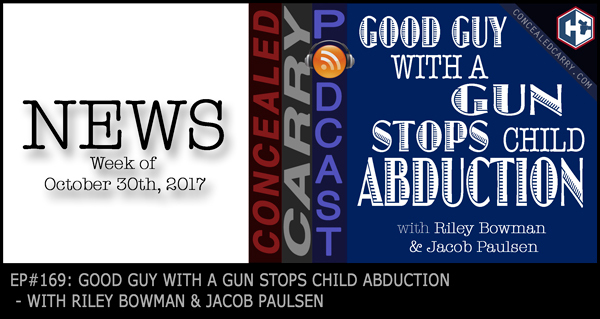 Plus DO NOT miss the story of a Las Vegas man that stopped the kidnapping of a 6-year-old boy because he made it a habit to always carry his gun on his person. It also was not hte first time he had to defend himself either. Riley and Jacob discuss at length, check it out! Hit the ‘PLAY' button and listen in now!! Every once in a while…SLOW DOWN! Even if you're an experienced shooter, sometimes it is good to slow down and make sure your fundamentals are solid. Take your time to make sure you GET IT RIGHT rather than FAST! I think this is the episode where you mention the former CEO of NPR who did a 180 on gun control. I think you also cited in this episode that gun sales have spiked since the end of 2016. I can say that I’m a liberal who, up until January of this year, was totally against guns, never touched a gun, only seen an actual gun up close once in my life. I now own a number of handguns and train on the range at least twice a month. But I do firmly believe in sensible gun control. So I believe I share the mindset of that CEO in terms of guns and I’m certain I contributed to that spike in gun ownership! I lament the fact that we need guns to protect ourselves, but I also think that if we have a 2nd Amendment, some of these gun laws are ridiculous. It’s ridiculous that New York govt wants to increase gun control after a terrorist TRUCK killing. But I have no problem with sensible gun control. MIchael, kudos for opening yourself to a different point of view. I think your example should help others expand their understanding of all types of issues. I find it disappointing that we all tend to formulate our opinions in conjunction with political parties. If more People would just focus on the topic and leave the politics and blame out of it, we would find that many times we agree on more than we realize. And in the end we don’t always have to agree with what other people believe. But to respect the persons right to have an opinion is what allows civil conversation. Thanks for sharing your story.